Most Windows users know that when you delete a file on a PC, it isn't truly gone and can still be recovered. In fact, those deleted files are actually just sitting there on your hard drive until they are overwritten with new data. To truly wipe data, users often turn to apps like CCleaner or Eraser that wipe free space for you. But Windows also has a built-in feature called Cipher that will overwrite deleted files for you and may even free up some extra disk space in the process. 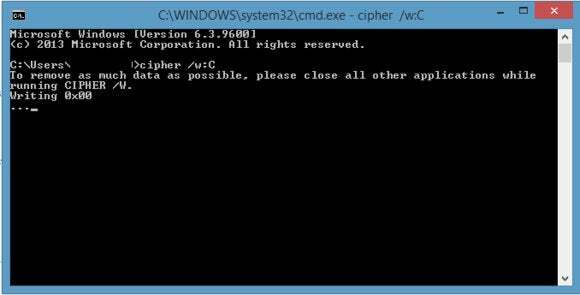 To use Cipher we have to dive into an area of your Windows machine that some hassle-free readers may have little experience with: the Command Prompt. Don't worry, though. While the command line can be a scary place, Cipher is a fairly safe feature. That said, it's always best to make sure you have your data backed up before giving something like this a try. Also, make sure you type the command correctly to avoid any unintended consequences. Cipher isn't just a tool to overwrite deleted data it can also be used to encrypt data, which is not what we want in this case. To get started you have to open a command prompt. To do this in Windows 8.1, hit the Windows key + S and type command prompt into the search box. Wait for the results to show up and then click the command prompt option. In Windows 7, it's easiest to click on Start > Run and then type cmd into the box and press enter. Now, just sit back and wait for Windows to do its magic. This is one of those tasks you should run when you're not using your PC. Consider running it overnight or during downtime on the weekend. Windows will also advise you to close as many running programs as possible to help the machine do a better job of clearing up your hard drive. Not only will cipher clean up your drive, it may also have the added benefit of returning some extra disk space to you. Recently, I let cipher run and got back about 10GB on a four year-old PC.